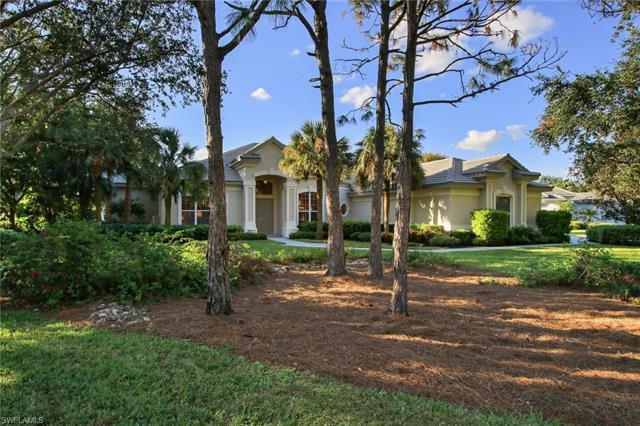 H.12378 - Positioned perfectly within the unique coastal community of Waterside in Pelican Landing awaits a meticulously maintained 3+Den/3.5 BA stunning pool home w/ 3 car garage. The 3, 129 sq. ft. open floor plan w/ light interior walls boasts 12' massive ceilings; luxurious crown molding; extra wide hallway to guest suites; cozy living room fireplace; tray ceilings and smooth wall finishes thru out the home. Kitchen features 2 large buffet islands with built in storage; newer appliances; double wall oven and breakfast bar/nook. Sliders from great room open up to a resurfaced spacious lanai w/ heated pool + spa; summer kitchen; outdoor shower; pool bath and breathtaking western long lake views. Directly off lanai, the large master suite features a bonus room off the master bath perfect for private gym or spa. If an elite lifestyle in an exclusive private beach community is for you....call to schedule your private showing today.